Organic acids are ubiquitous throughout the field of chemistry. Whether used as a solvent, a substrate, a strong acid, or in a catalytic amount as a Bronsted acid source, organic acids are as commonplace as glassware for the researcher. Loba Chemie offers its customers with a full range of basic products for organic synthesis reagents and solvents most commonly used in organic synthesis. 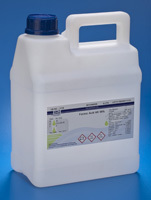 You can obtain these in quantities to meet laboratory scale or bulk production. We offer these compounds customized to your needs and with a large number of packing options.